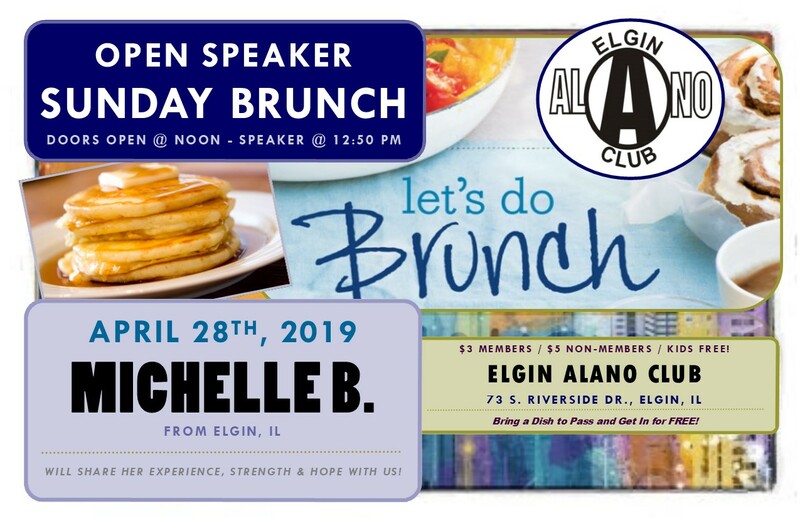 Sunday Open Speaker Brunch – Michelle B. Speaker Lil’ Michelle B. from Elgin, IL will share her experience, strength and hope with us! $3 Members / $5 Non-Members / Kids ARE ALWAYS Free! Bring a Dish to Pass and get in for FREE! 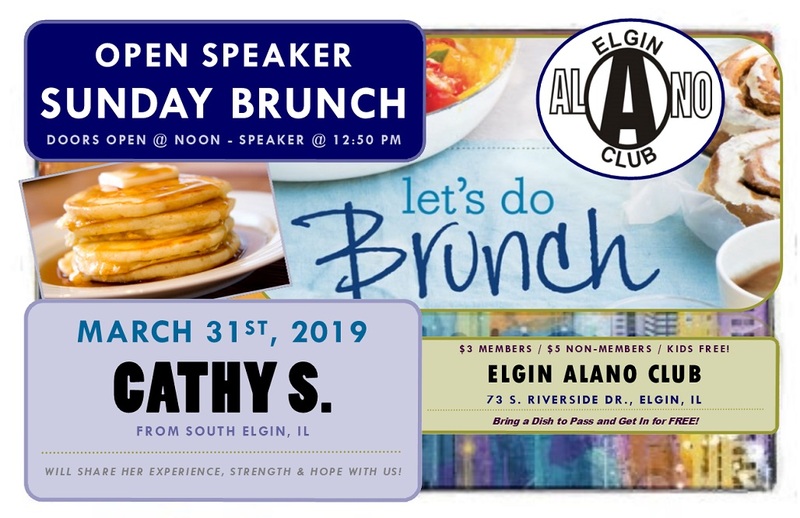 Sunday Open Speaker Brunch – Cathy S.
Speaker Cathy S. from South Elgin, Illinois will share her experience, strength and hope with us! Sunday Open Speaker Brunch – Dwayne G.
Speaker Dwayne G. from Elgin, Illinois will share his experience, strength and hope with us! Sunday Open Speaker Brunch – Danny D.
Speaker Danny D. from Elgin, Illinois will share her experience, strength and hope with us! 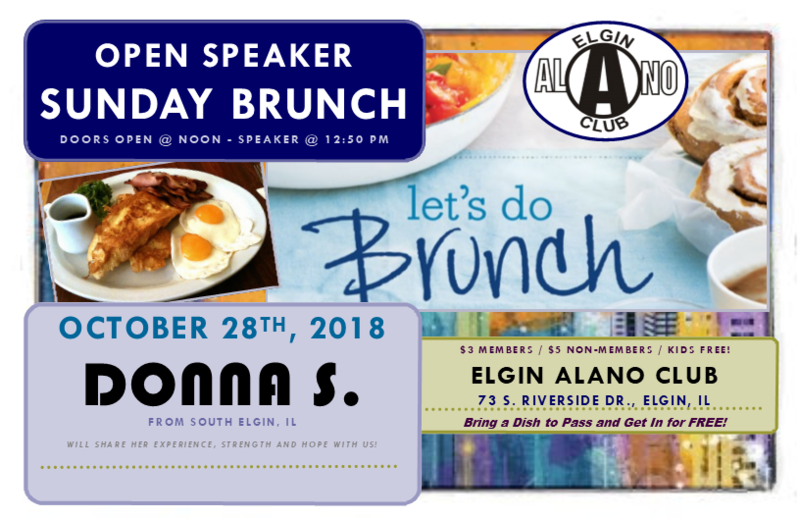 Sunday Open Speaker Brunch – Donna S.
Speaker Donna S. from South Elgin, Illinois will share her experience, strength and hope with us! There isn't freedom in any one of these four activities, and yet, I had somehow become convinced in my early recovery that my staying sober would greatly depended on my ability to become really, really good at number 4... trying not to drink: Level Expert! Ironically, that is the thing that a non-alcoholic and a recovered alcoholic have in common – neither one is trying not to drink. In fact, the only people on the planet who try not to drink are untreated alcoholics. The question I had asked myself every morning in my active addiction was "Where's alcoholc going to be?" Because wherever alcohol's going to be, that's where I'm going to be. In my early recovery, prior to working the 12 steps, I asked myself the same question, for a much different reason. "Where's alcohol going to be?" Because wherever alcohol's going to be, that's the place I need to avoid. The problem with that method of staying sober, for me, is that alcohol was still controling my life. The only difference being that I wasn't getting to enjoy the benefit of the sense of ease and comfort that comes at once by drinking it. Today, greatful to say, when I wake up in the morning, I no longer ask the question. I don't care where alcohol is, what it's doing, nor who it's doing it with. If I have to go someplace where alcohol is present, I'm fine; if I have to go someplace where alcohol ins't present, I'm just as fine. To me, that is the miracle of it. To me, that is freedom. I found my hero at an Club meeting. I was new to the program and she went out of her way to show me the ropes of becoming grateful and spiritual. Every day she reminds herself to do the right thing, and to be grateful for what she has. She's a mother, girlfriend, and sponsor. And she's changed my life in many ways.